Remedy Entertainment has already settled on the plot for Alan Wake 2, and now the studio just hopes it will have the chance to actually make it. Things are looking pretty good for Alan Wake at this point. After more than a half-decade of development, the game is finally on the cusp of release and the critical response has been very positive. But the question of a sequel hinges on sales, not review scores, so Remedy is still keeping its collective fingers crossed for big dollar signs and the chance to do a follow-up. 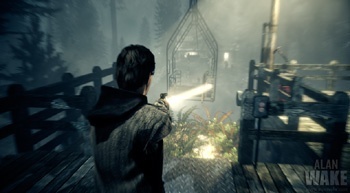 "Well, it's certainly no secret that we'd love to make a second one if the first one does well," Remedy's Mikko Rautalahti wrote in the Alan Wake forums. "But since the game isn't even out yet, it's really up in the air." "Clearly, it's been a critical success; the fact that some people feel differently about it doesn't change the fact that of the scores listed in the first post of this thread, there are eight perfect scores, and over 40 give us a 9 or a better. Only 7 reviews have given us a score of less than 8," he wrote. "That tells us in no uncertain terms that there's a lot of love for Alan Wake out there, and we'd have to be complete goddamn idiots to not be satisfied with that. I mean, sure, the next time, we definitely hope to top that, it's nice to have something to aim for, but we're pretty damn far from disappointed." The studio already knows what it wants to do if a sequel does get the green light, which we can only hope means we won't have to wait until 2016 to play it. "We do know where season two is going to go," Oskari Hakkinen told CVG. "Season one will have a conclusive and satisfactory ending but we will leave doors open for season two and we know where we're going to take the story."